I grew up on Long Island and still return as much as I can to visit my parents and my brother’s family. 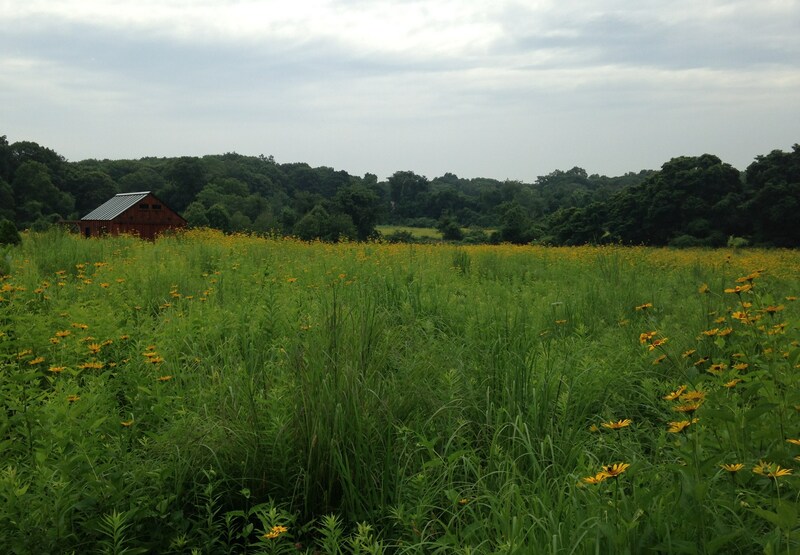 This last time while the kids were playing and others were visiting doctors and shopping, I snuck off alone for a visit to the Avalon Park and Preserve in Stony Brook, NY for a summertime peek at their fields of prairie plantings. I was not disappointed. In mid July Heliopsis helianthoides (false sunflower) dominates the former farm fields of Avalon. Keep in mind this photo was taken from above since most topped out at around five feet! This is North shore Long Island, gold coast, old money territory, and with a location approximately 40 miles out of Manhattan it’s retained much of its city escape feel. Think Great Gatsby, and although most of the old mansions have either fallen to ruins or been leveled there are still plenty of old estates and gentleman’s farms. Fences and gates usually separate the common people from these retreats but in this case several tracts were purchased and the gates were opened. Common milkweed dotted the prairie but I didn’t see a single nibbled leaf or monarch caterpillar. Avalon is made up of three sections, Avalon Park is a manicured area with woodland plantings, walking trails, and art features, Avalon Preserve consists of hiking trails through woodland, old field hedgerows, and the prairie plantings, and East Farm Preserve is a Nature Conservancy property accessible through the Avalon sections. The three parts combine to form a nice cross section of Long Island’s former wilder self. 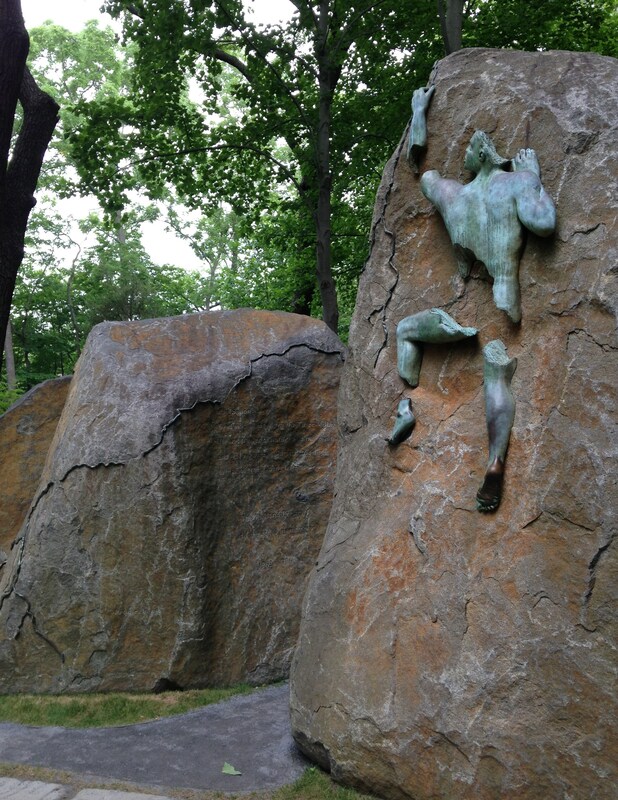 Paul Simmons memorial at Avalon Park and Preserve. Although today the park is a peaceful oasis filled with children playing and friends strolling, the origins of the park are rooted in grief. In 1996, 34 year old Paul Simmons was killed by automobile collision while cycling nearby. To celebrate his life and love of the outdoors the park was created. 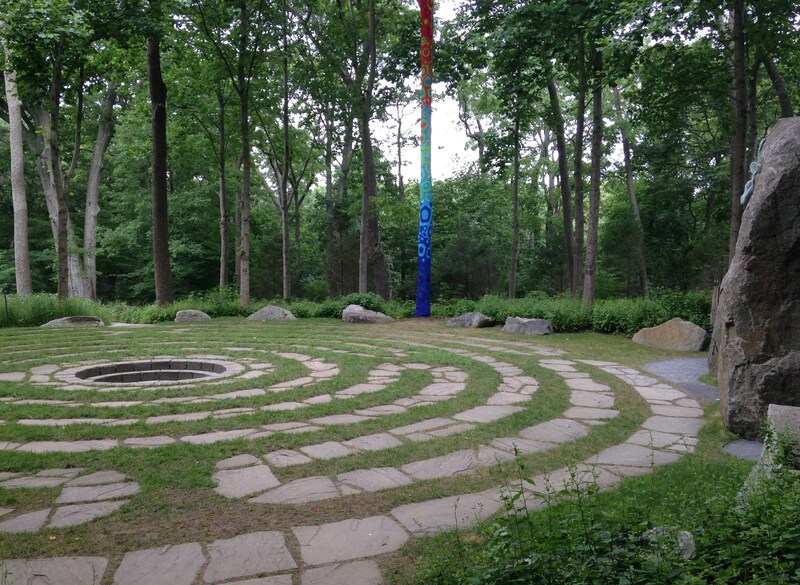 At the site of a former pre-park residential building a memorial for Paul has been built, with an adjacent meditation labyrinth. On this visit art installations of colorful knit ‘tree sleeves’ and hanging patterns dotted the area. The park plantings, buildings, and care reflect a healthy park endowment and it’s not surprising considering that the father of Paul Simmons is one of the world’s wealthiest men. James Simons is a math man who has translated his mathematical talents into the financial markets and stands somewhere in the 70-80 range of wealthiest people worldwide (around 30th for wealthiest Americans). His story is a fascinating one, but his estimated 14 billion net worth surely hasn’t hindered park funding, and is always the subject of whispered stories in the three villages area of who works for his remarkably successful Renaissance Technologies and what their annual take home pay might be. A second residence on purchased park property has been transformed from a 1940’s ranch to a coastal New England style park office, ready for park foundation functions and always immaculately manicured. 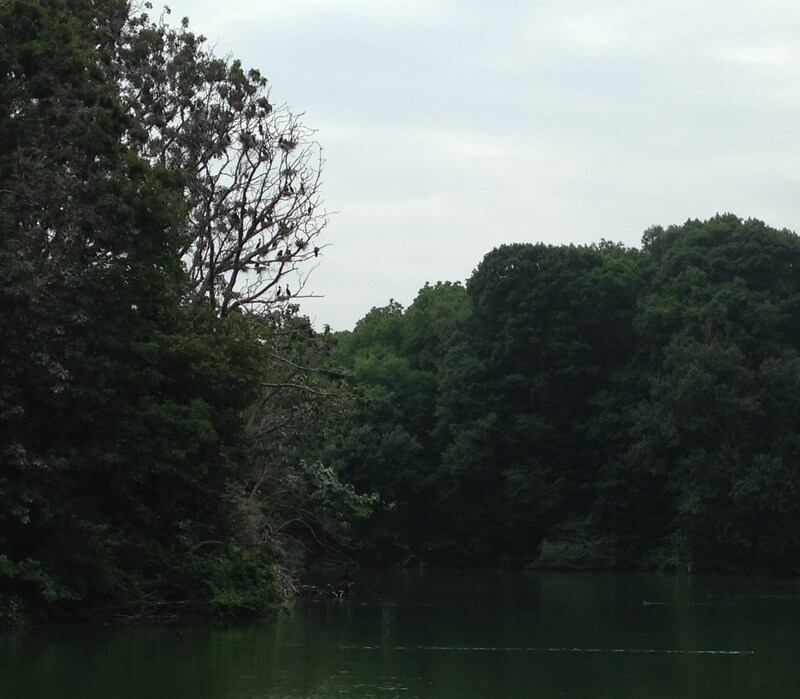 Coming down out of park brings you down to the Stony Brook mill pond. This is the duck pond I loved visiting back in the day and is the power source for the Stony Brook grist mill (c.1751). As recently as 1940 the mill was still carrying on the work of grinding local grains into flour and even today the wheels are put into motion on summer weekends for the sake of tourists. It’s an area rich in history from the sea captains who settled around the harbor, to the colonial farms which cover the rolling hills, to the Manhattan escapees who missed the train to the Hamptons and ended up here. Cormorants nesting on a mill pond island. These are relatively recent arrivals to the area, only now recovering from their fish-robbing persecution from days gone by. I love this area for its quiet waterfront peacefulness and many hidden treasures, but on this visit it was the flower filled fields which really made me smile. On a still summer morning the low hum of thousands of native bumblebees visiting the flowers and the less-than-springtime-frantic chirping of songbirds really worked magic to calm the day. Avalon prairie plantings. 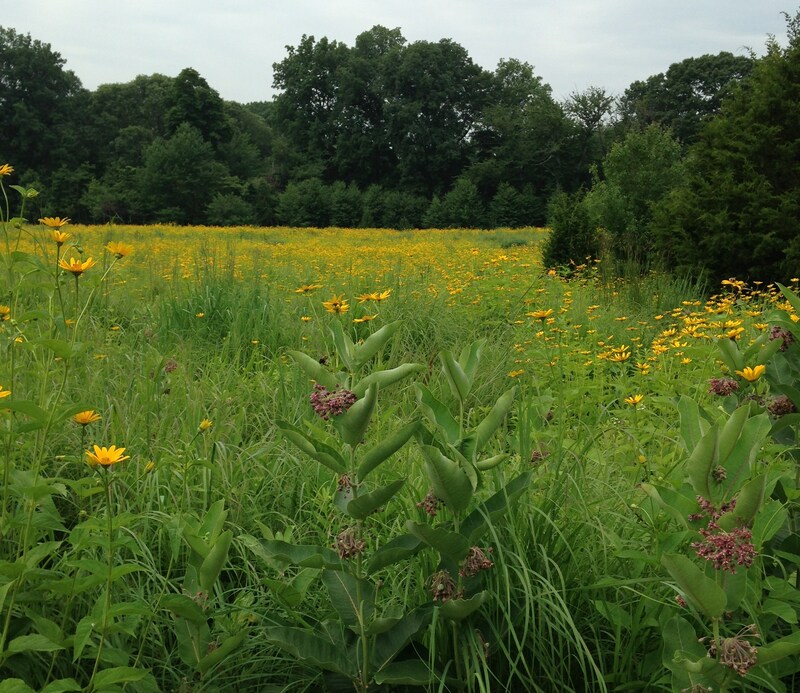 Even with the heliopsis blooms dominating early summer, there were plenty of other native grasses and colorful perennials to carry on for the rest of the year. 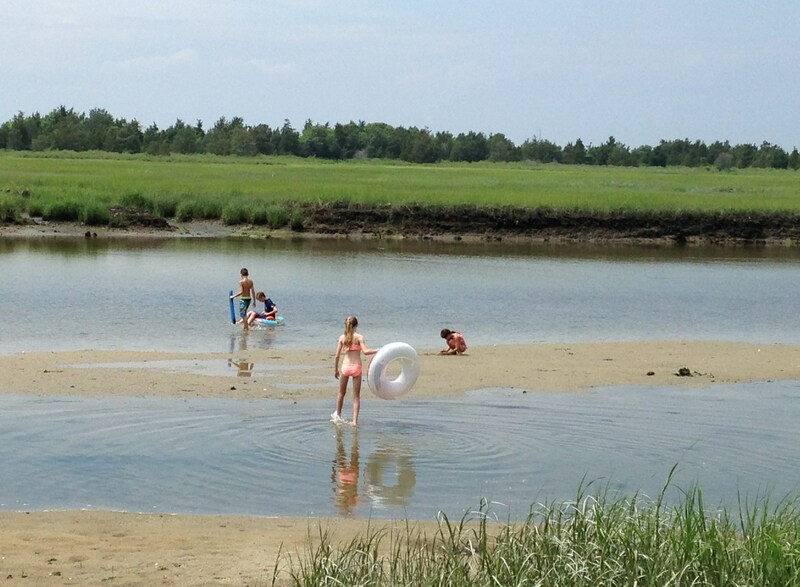 Cousins exploring the salt marsh near West Meadow beach in Setauket, NY. Now back to the garden. We’ve been to Florida and back in the meantime and catching up in the garden has been an uphill battle against Japanese beetles and crabgrass…. but there’s been plenty of pool time too, so I really can’t complain! 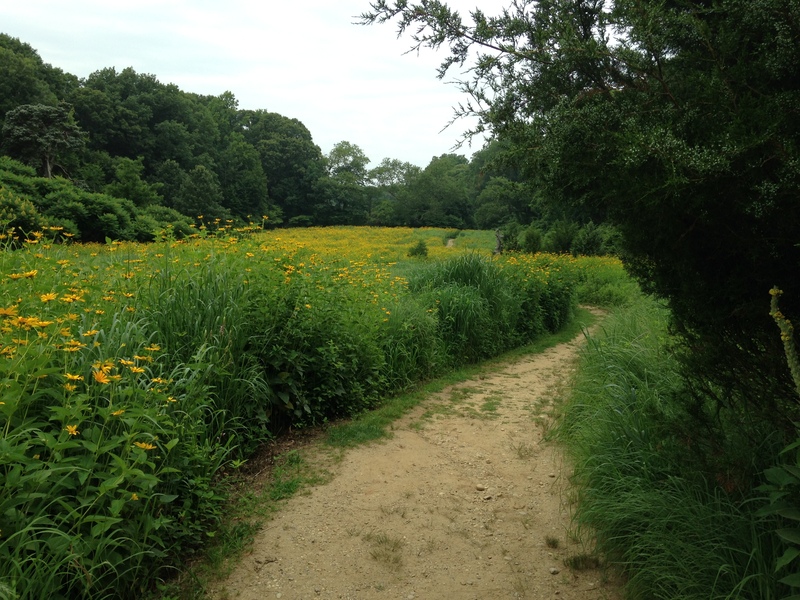 This entry was posted in garden design, garden stories, garden tours, summer, Uncategorized, wildflowers and tagged avalon park, growing heliopsis, long island, prairie plantings, stony brook, things to do in stony brook ny. Fabulous post Frank; you obviously love the place and your mood came through in your writing. thank you for sharing a place you love with someone who knows nothing about this area of the world. Welcome home and do just take time to enjoy your garden too. I’d like to post more about my old Long Island haunts, but there’s only so much time and I rarely feel like traipsing around with a camera when I’d rather be paying attention to the people I’m with. Thats important. Sometimes just being and seeing is the right thing. So many of the parks are small and hidden and they’re not really big on advertisement. I didn’t realize you were so close! Send me an email sometime if you’re interested in a few other nice visits in the area, many are just barely marked driveways or narrow side entrances and usually only found by word of mouth. I don’t think the three parks together are much more than 150 acres total, so it might seem bigger than it really is, but regardless of size it’s a fantastic escape in such a built up and restricted access area. I visited Dorflinger several years ago to visit the glass museum and walk the sanctuary, and you’re right that it does give the same feeling. They’re both great places to visit to just relax. What a great park. I never heard of the Paul Simmons Memorial. 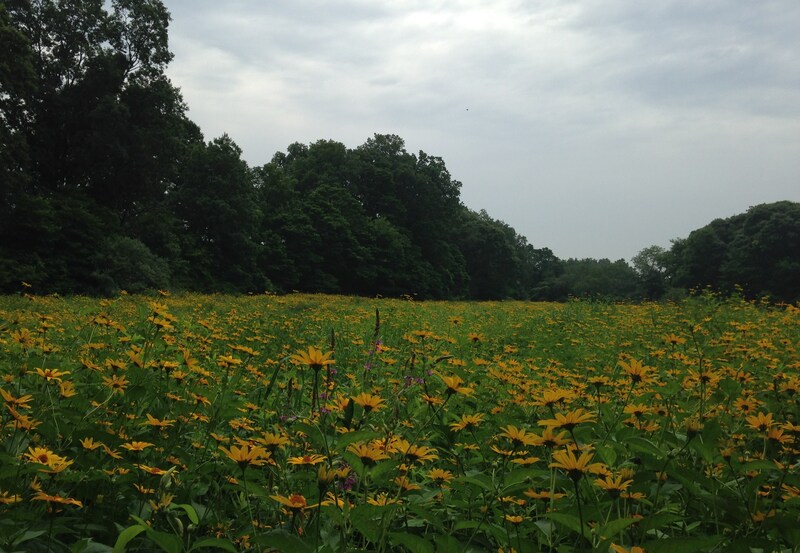 Avalon Park is a wonderful place and has such beautiful fields of false-sunflower. Nice trip! So many parks stop at the purchase and development of trails, this one really makes an effort at maintaining the feeling of openness, controlling invasives, and managing different ecosystems. It’s a great example of land stewardship. I too grew up on Long Island (pronounced Long Guyland by most of my family). Not familiar with Avalon, which looks like it is really worth visiting. Sadly I have no more family left to visit in metro NYC – they are dispersed to exotic places like Minnesota and South Jersey. I do remember visiting Jones Beach, the Old Westbury Gardens, and the Teddy Roosevelt estate when I was a kid (talk about old money!). 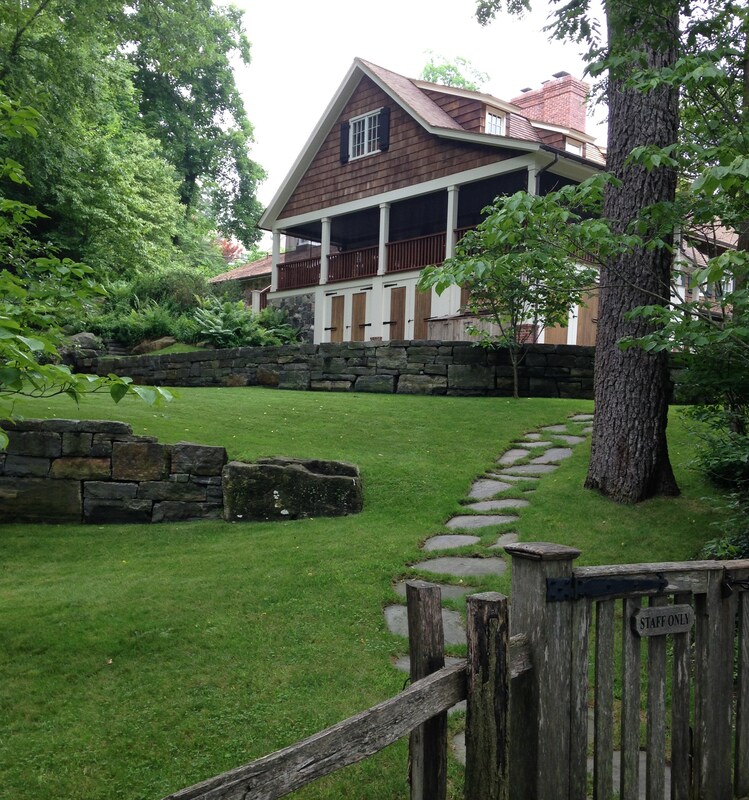 I think the Teddy Roosevelt estate was a required field trip for when I was growing up! All I remember is a lot of mounted animal trophies. Old Westbury is still worth a visit, it’s only become better. Peer pressure has made me loose the accent, and two years in Texas scared the last of the Yankee out of me!